BOSTON, Mass., Mar. 3, 2017 – FantasyLabs Co-founder Peter Jennings will participate in a panel at the 2017 MIT Sloan Sports Analytics Conference. The panel, presented by DraftKings, features a discussion on the unique strategies players use to create successful fantasy lineups. Featuring a diverse group of participants, from academics to professional players, the panel discussion will focus on ways to leverage fan data to be at the very top of the 7 million people who play daily fantasy sports. The MIT Sloan Sports Analytics Conference provides a forum for industry professionals and students to discuss the increasing role of analytics in the global sports industry. The conference is open to anyone interested in sports and tickets are available to the public. 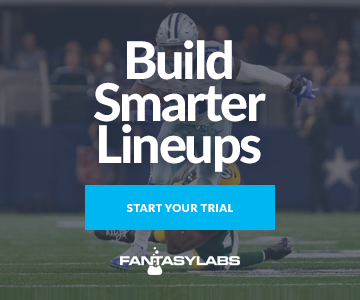 FantasyLabs provides daily fantasy sports players with real-time data and tools to test theories, quickly create and backtest models, and ultimately construct profitable DFS lineups. For more information, visit www.fantasylabs.com.